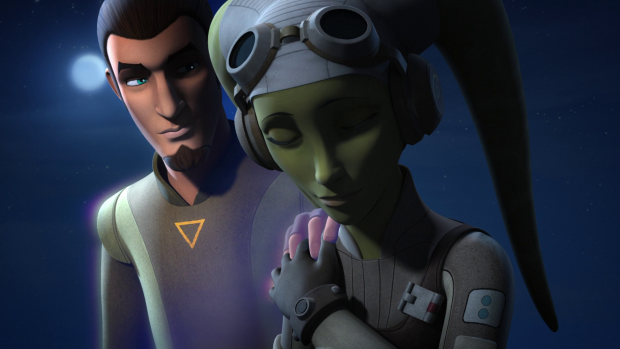 Star Wars Rebels sets up the final phase of the series with more Jedi mysticism and a continuation of the grief being experienced by the characters. The best way to describe this episode is that it’s a prologue meaning its primary function is to set up the elements that will become important in the coming episodes. This certainly happens though the trade off is that not an awful lot happens within the confines of the episode itself. An obstacle exists right away as the group have to make their way to the Jedi Temple which is a considerable distance away. This is easily solved by Ezra summoning a group of Loth Wolves who are content to take them on their backs. The unique interactions the characters have with the Wolves are a lot of fun with the definite highlight being Zeb’s nervous disposition around the animals. It’s brief but amusing and gets the plot moving. 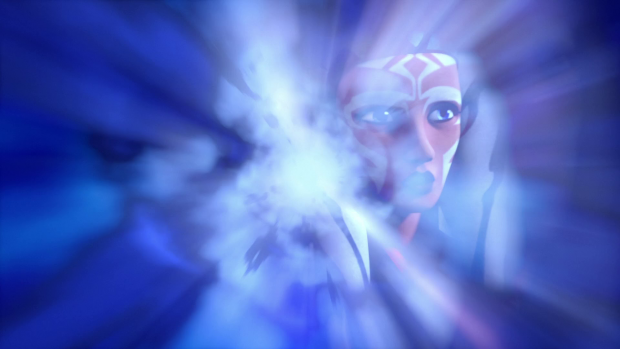 The group travel through the same method used in “Kindred” which is punctuated by a cool visual and callbacks to earlier moments in the series including some words by Ahsoka Tano. This reminds the audience and the characters that everything is connected in some way and that every action taken has been leading to this moment. What this will result in is unclear but the gradual building of the mystery has been compelling. Arriving at the Jedi Temple immediately brings dangers as the Empire have set up a research outpost to discover its secrets. Emperor Palpatine (Ian McDiarmid) himself has commissioned this and sent Minister Hydan (Malcolm McDowell) to conduct the research. His findings so far link back to one of my favourite Clone Wars stories starting in “Altair of Mortis” with a painting depicting the representations of the Force featured in those episodes. The context of this in terms of this show is that there is a mystery to be solved and the painting depicts Gods but those who know Clone Wars will definitely get more out of this. Both Minister Hydan and the Emperor are largely ineffectual within the episode. Minister Hydan is very much there to explain things and has no real character on his own. The same goes for the Emperor who only exists to point out that Kanan’s death has a cosmic significance that eludes him. 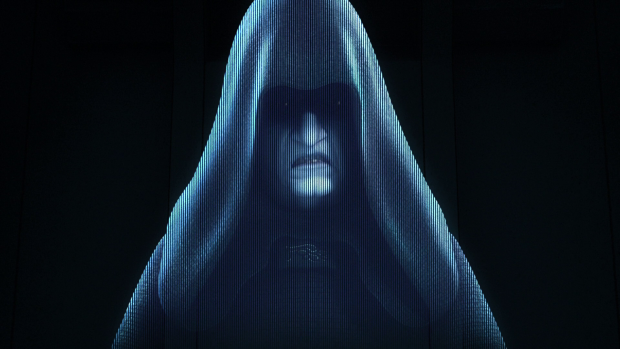 Palpatine’s presence does confirm the importance of these events but the episode fails to use him effectively. 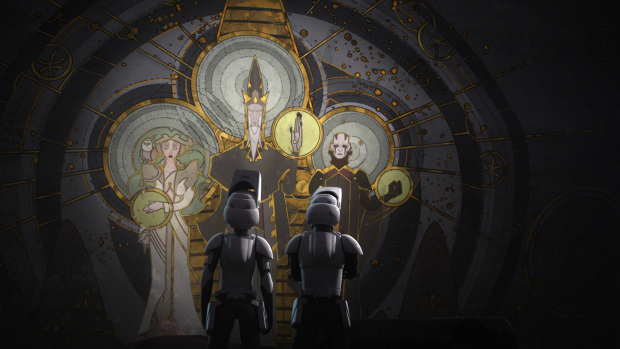 Ezra and Sabine are the focus of this episode as they infiltrate the Jedi Temple and attempt to solve the puzzle. Sabine’s role as an artist offers unique insight into the meaning behind the painting and she is able to interpret what it depicts while suggesting a way to solve the puzzle. Ezra is clueless but Sabine’s advice gives him something to work with and he is able to use that to open the gateway. Using Sabine’s artistic nature in such a way is great as it allows her talents to be used practically to move the plot forward. She becomes useful to the overall plot in a really natural way and the solution feels like something only she could have come up with. It’s a great way to use the character and works brilliantly. The painting is visually impressive and the alterations that happen are visually striking with the 2 Dimensional images moving on a 3 Dimensional surface to suggest something otherworldly. It’s a simple trick but very effective and ties into the mysticism nicely. The whole thing feels like a video game puzzle though and the way the solution presents itself further reminds me of that. It all fits together really well to make for a satisfying sequence. Ezra initially lacks the necessary confidence to continue because he is aware that every time the Jedi Temple opened prior to this point it required the efforts of a master and an apprentice. Since Ezra’s master is gone he doubts his ability to open the Temple but Sabine is able to snap him out of it by pointing out that they don’t have the luxury of self doubt and have to find a way to solve the puzzle before the Empire stop them. Ezra still has his doubts but tries anyway and ultimately succeeds as Sabine is captured by the Empire. At this point Sabine’s capture doesn’t feel like a big deal though Kanan’s death sends the message that the characters aren’t safe any more especially this close to the end. Sabine’s capture could result in her death and I get the impression that Sabine has accepted that this mission may be a one way trip for her. The odds are stacked against them so the possibility must be on her mind at the very least. Her bravery and commitment to the Rebellion is admirable as she knows what she has to do even if she doesn’t make it back. Hera is still struggling with her grief and this manifests in a reluctance to make decisions. Once the Imperial presence at the temple is discovered she hesitates before telling Ezra and Sabine to head in to solve the problem. Either Kanan’s Force Ghost is there to comfort her and give her the confidence to make the decision or she imagines that he’s there with her; either way she uses him as inspiration to carry on and decide that the mission itself is worth the risk of losing more people. It’s a very subtle character beat but encapsulates Hera’s emotional state perfectly and shows that grief doesn’t go away easily. A compelling if uneventful episode that sets things up for the final stretch of the season. The inclusion of the Emperor feels like a missed opportunity as he isn’t used very well in the context of the story though his presence does confirm the importance of these events. 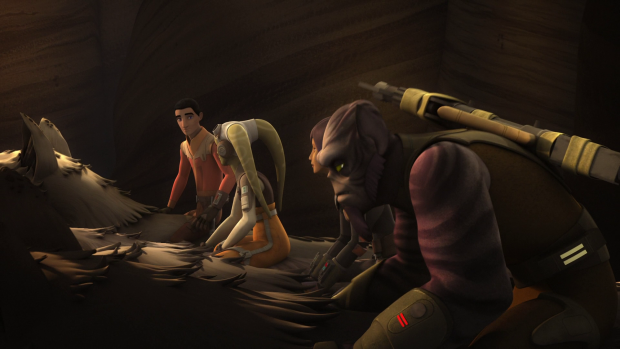 Ezra and Sabine working to solve the puzzle is the highlight of the episode as it uses Sabine’s role as an artist to great effect. Nobody else on the cast could have interpreted the painting as she did making her appearance significant. Sabine’s reaction to being captured and the added jeopardy brought on by Kanan’s death adds further tension. Ezra’s lack of confidence in his ability to open the temple adds further weight to Kanan’s loss as Ezra doubts whether he can carry on without his master. Hera is still characterised as grieving as shown by her reluctance to make a decision that would place more people in danger. Either Kanan’s Force Ghost or her imagination allows her to use his memory to strengthen her resolve but she is still struggling which is good to see as it would take longer than a single episode to process a loss like that.